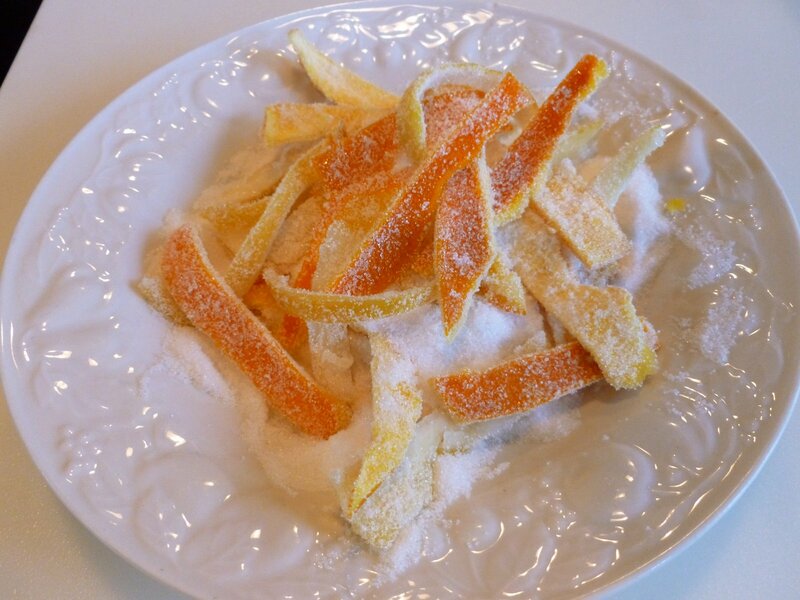 Orange and lemon peel can be candied to make a yummy treat. The rule to go by is to use 8.5 ounces of water and 4.5 ounces of sugar per orange, for measurements, a lemon is half of an orange. 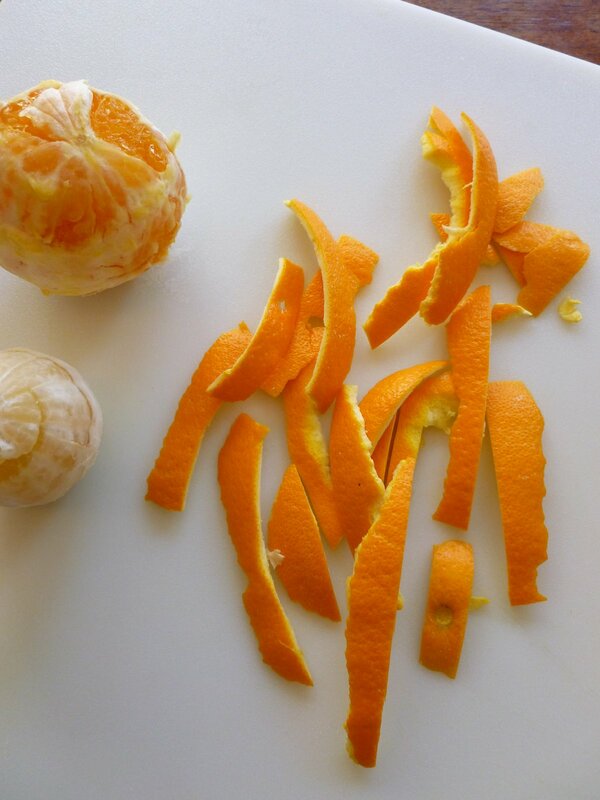 Peel the orange, using a small knife or peel using your hands. Don’t worry if small amounts of white pith remain. 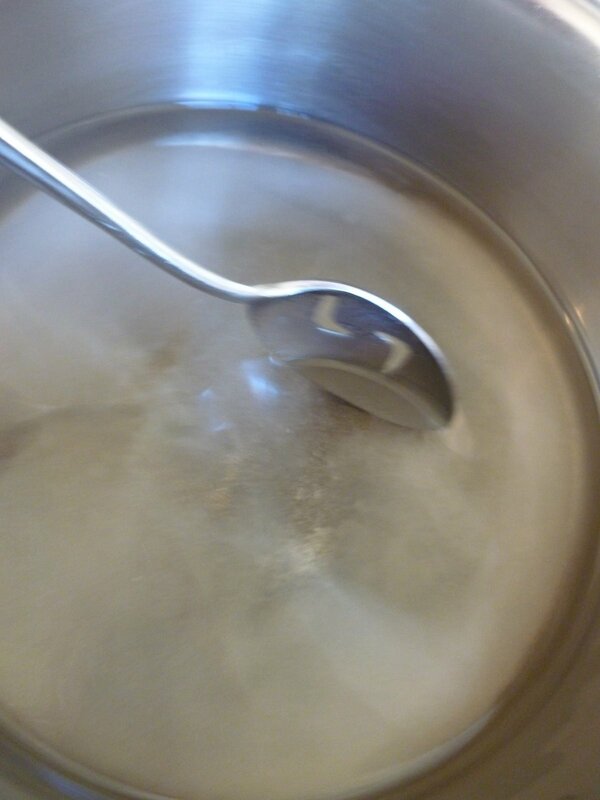 Boil the sugar and water over medium heat to make a sugar syrup for 5 minutes, uncovered. 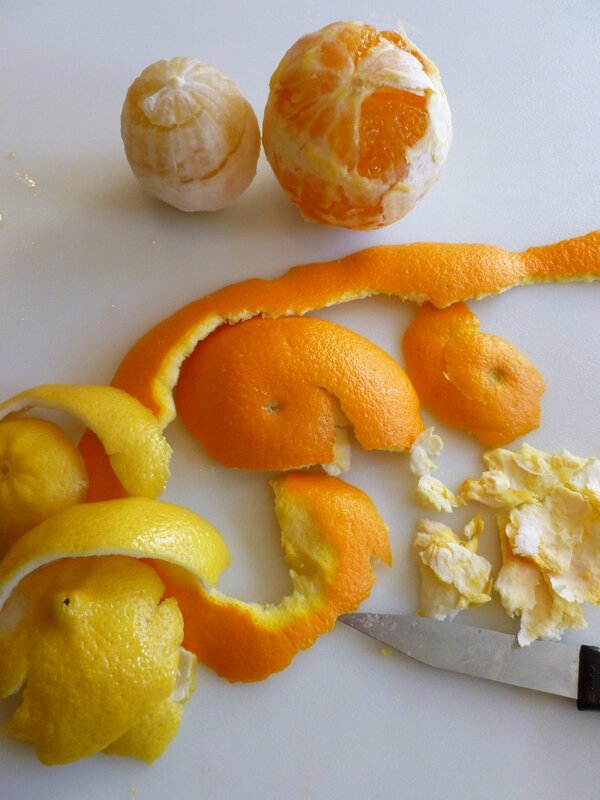 Peel orange and lemon and cut away the pith. 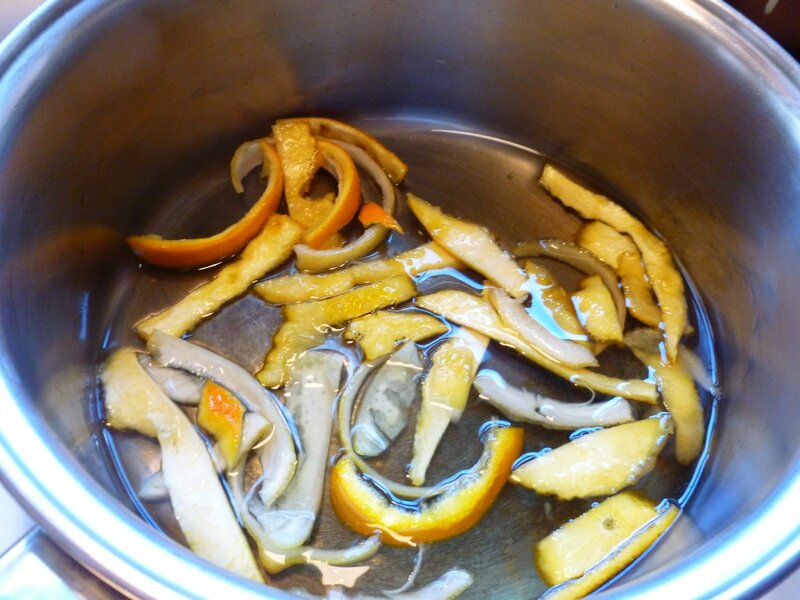 Cook the peels in the sugar syrup, do not stir during this process, that may cause the formation of large sugar crystals. Simmering takes 2 hours. Remove the saucepan from heat and allow to cool. Once cool, drain the peels in a colander. Turn oven to 200 degrees. Reserve the simple syrup when draining. Place 1/2 cup of sugar in a small bowl. Dredge the peels in the sugar until they are coated. 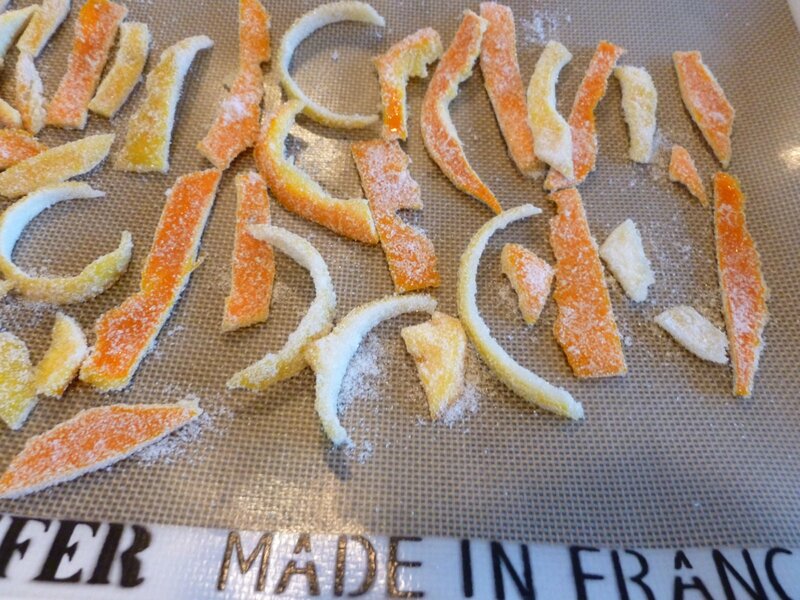 Place the sugar-coated peels on a baking sheet lined with parchment paper or a Silpat. Place the sugar coated peels in a warm oven and allow them to dry out. This should take 1 hour, check every 20 minutes to make sure they are not cooking or burning. 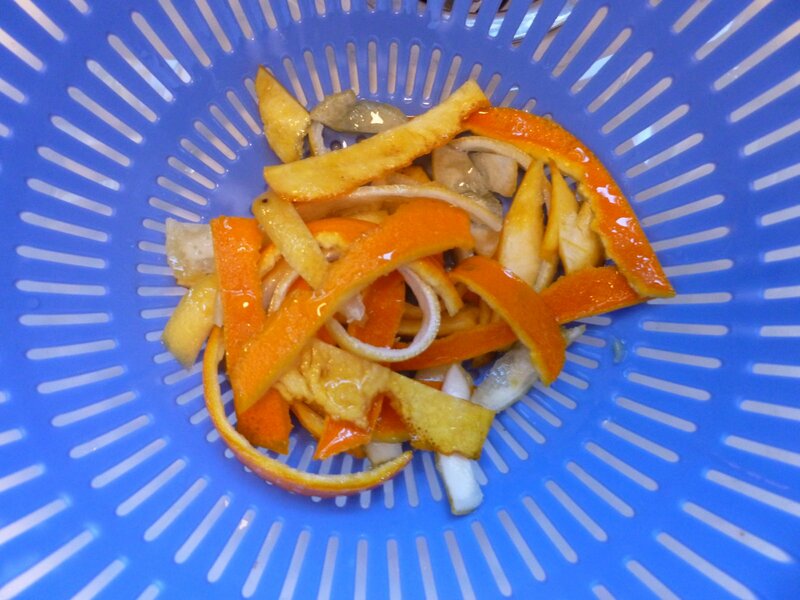 Also, as an alternate way, the peels could be left on a drying rack overnight instead of placing them in an oven. Once peels are completely dry, scrape off any excess sugar clumps. Store them in a dry location, they should keep for weeks. 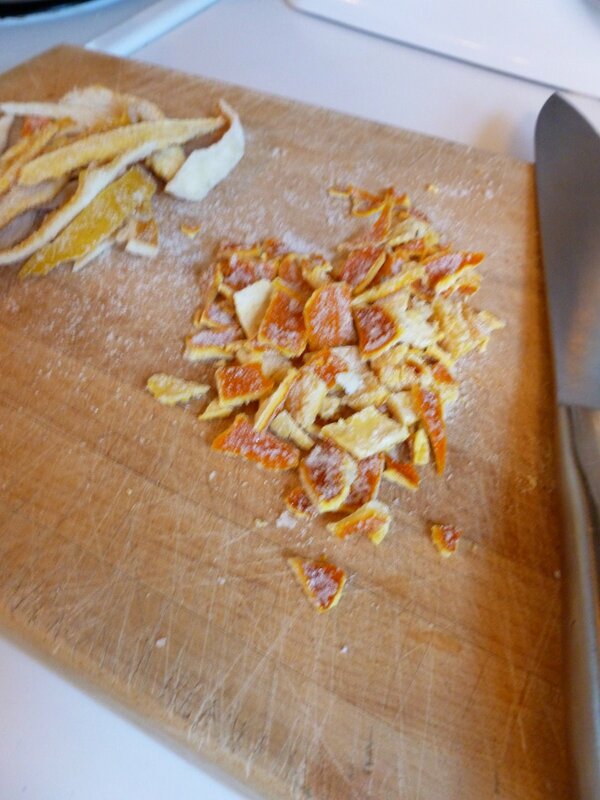 Candied peels can be dipped in melted chocolate and enjoyed plain, or used in a cake, cookie, candy, or bread recipe. 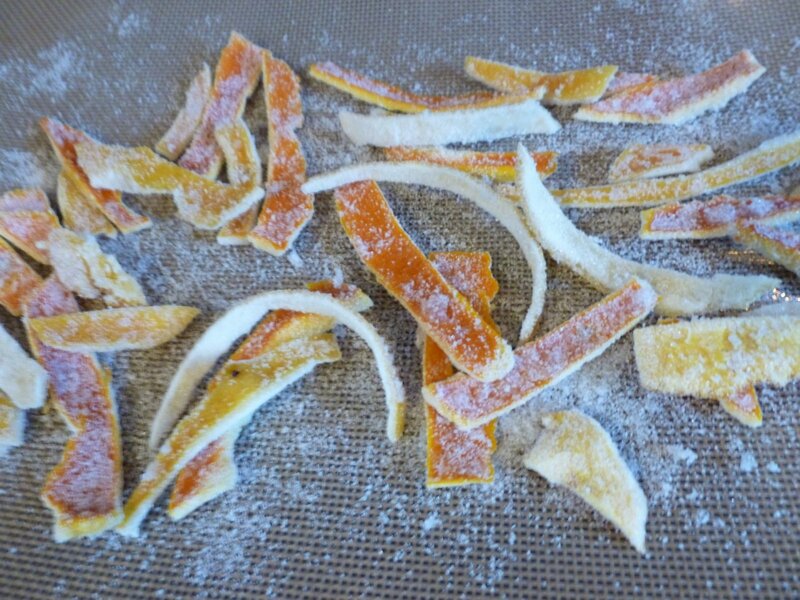 Today I am using the candied orange peels in my recipe for Candied Orange and Cranberry Sauce. 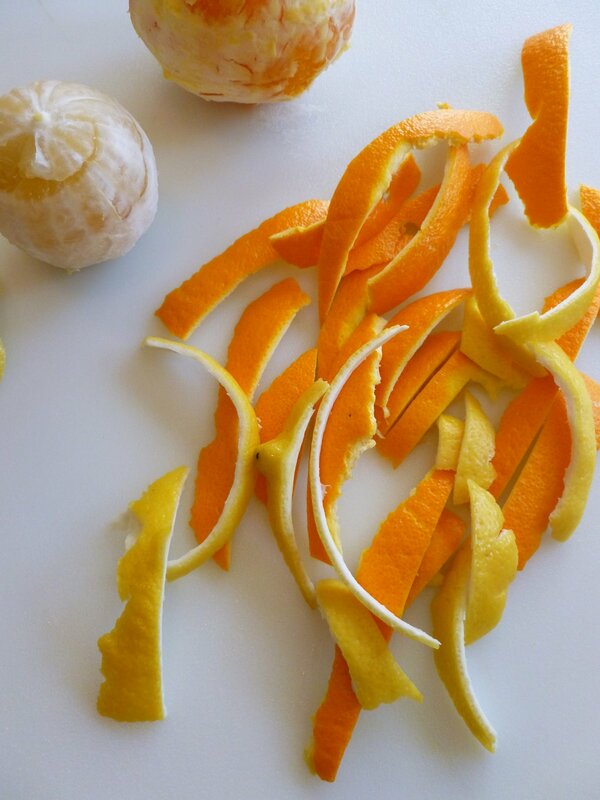 Use a knife or a citrus peeler to score the orange and lemon peel. Peel carefully trying to keep the peels intact as much as possible. 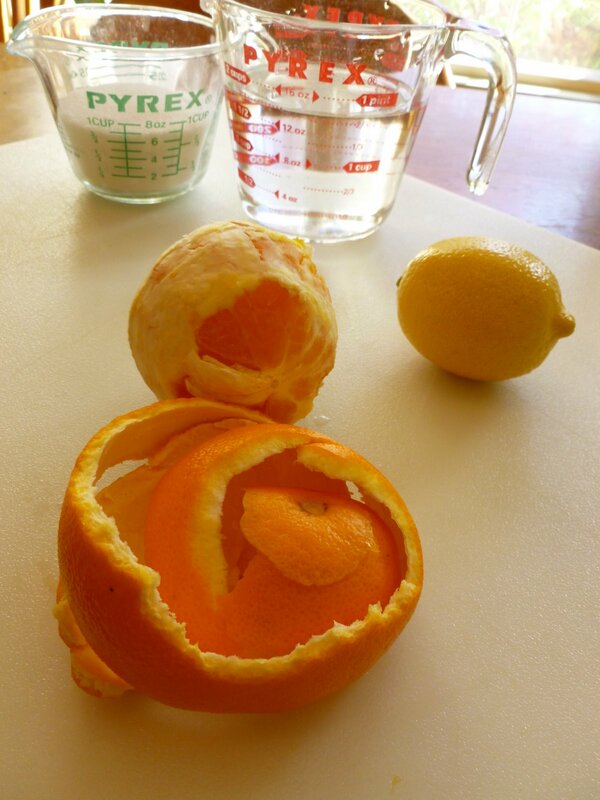 Set the peeled orange and lemon aside and reserve for another use. 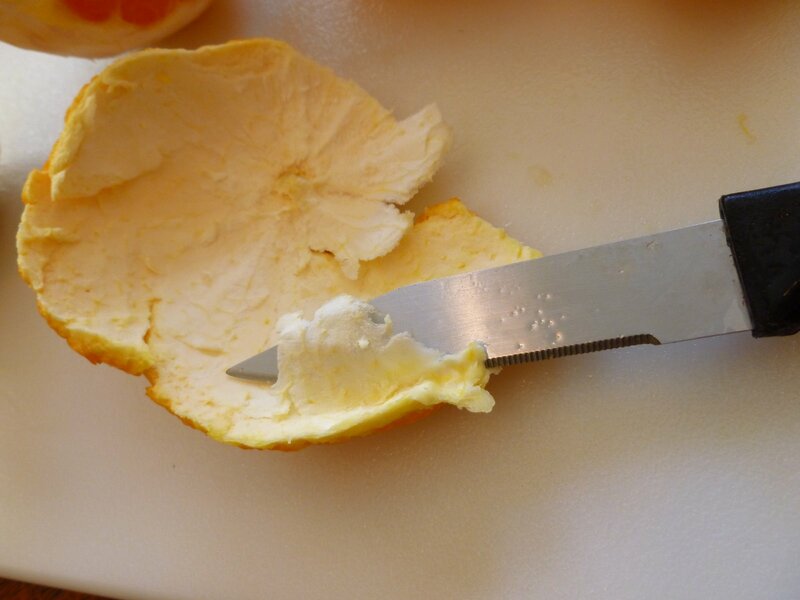 Using a sharp knife, cut away the the bitter white pith from the underside of the peels. The remaining peel should be 1/8″ thick. Don’t worry if small amounts of white pith remain. 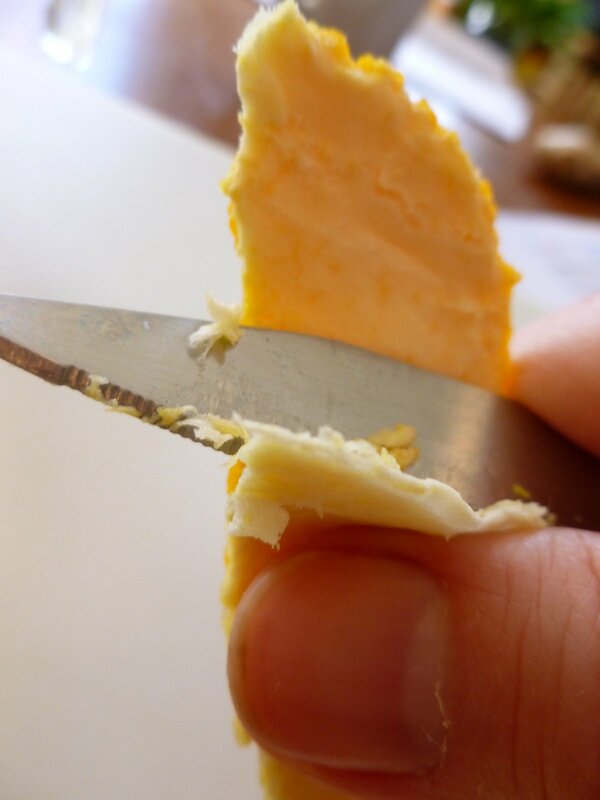 Slice the peels into long thin strips approximately 1/2 ” thick. Combine 12.75 ounces of water and 6.75 ounces of sugar in a medium saucepan over medium heat. Stir to dissolve the sugar, and heat, uncovered, until the sugar boils for 5 minutes. Add the strips of peel and turn the heat down low, until the mixture is just at a simmer. Cook, uncovered and simmering, until the syrup reduces to a quarter of it’s original volume ( the syrup will barely cover the tops of the peels) DO NOT STIR during this process, as that may cause the formation of large sugar crystals. The simmering takes 2 hours. Remove the saucepan from the heat and allow it to cool. Once cool, drain the peels in a colander. Reserve the simple syrup for other recipes. At this point, turn the oven to 200 degrees. Place 1/2 cup of sugar in a small bowl. 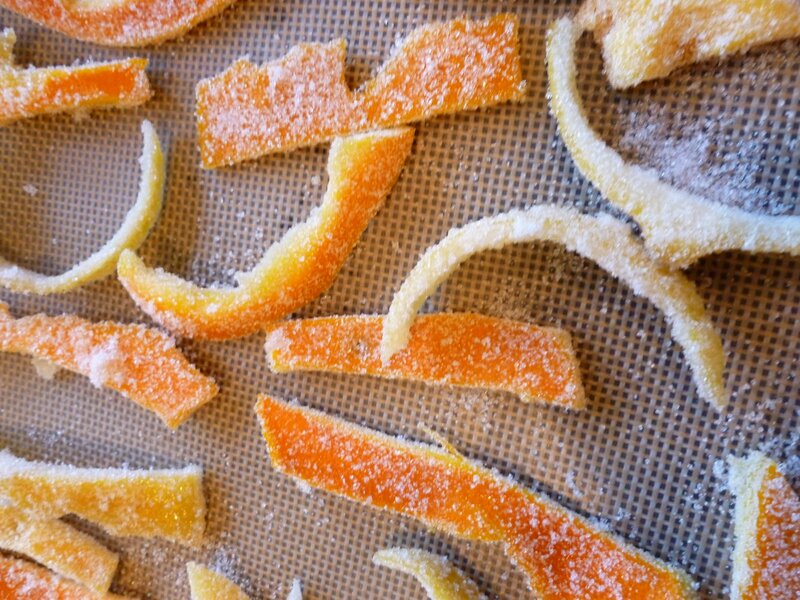 Dredge the peels in the sugar until they are coated and place them on a baking sheet lined with parchment or a Silpat. Place the sugar-coated peels in the warm oven and allow them to dry out. This should take one hour, but check them every 20 minutes to ensure they are not burning or cooking in any way. Or they can be left to sit overnight on a drying rack instead of placed in an oven. 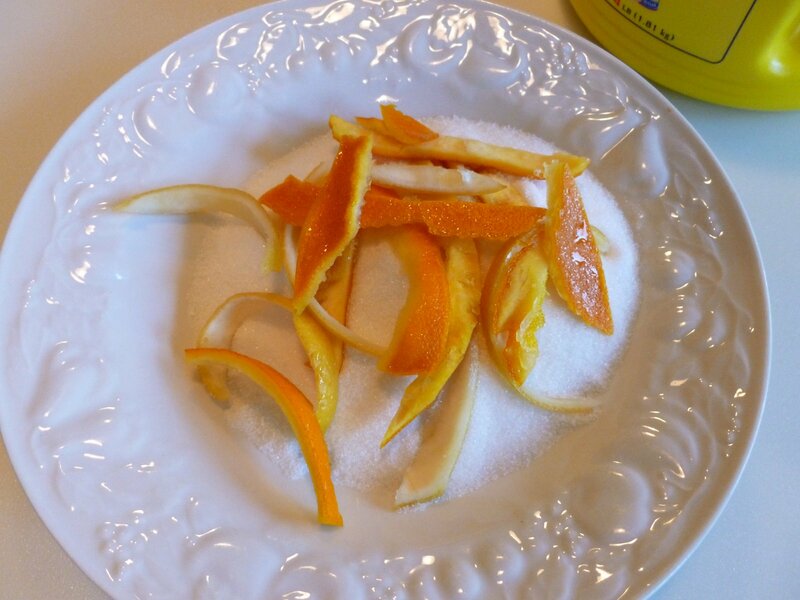 Once peels are completely dry, scrape off any excess sugar clumps. Store them in a dry location and they should keep for weeks. 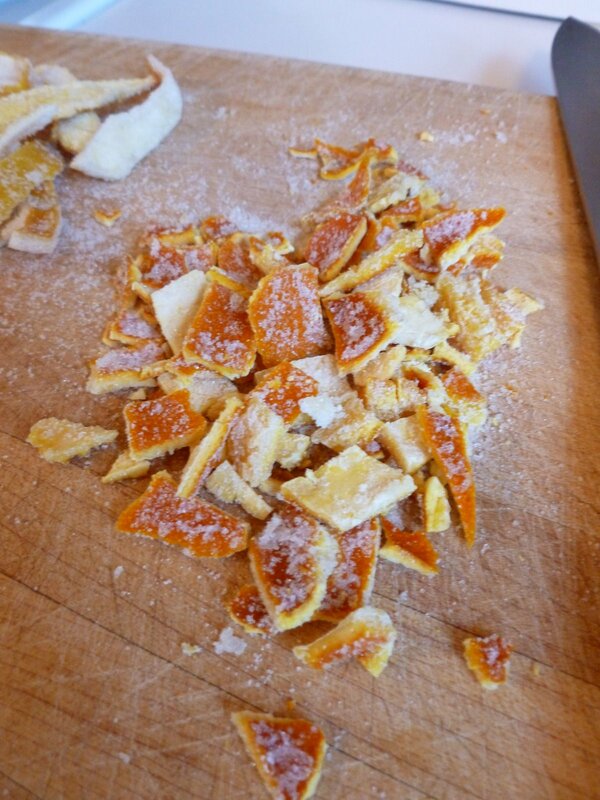 Candied peels can be dipped in melted chocolate and enjoyed plain, or used in a cake, cookie, candy, bread recipe or as I used them in my Candied Orange and Cranberry Sauce. 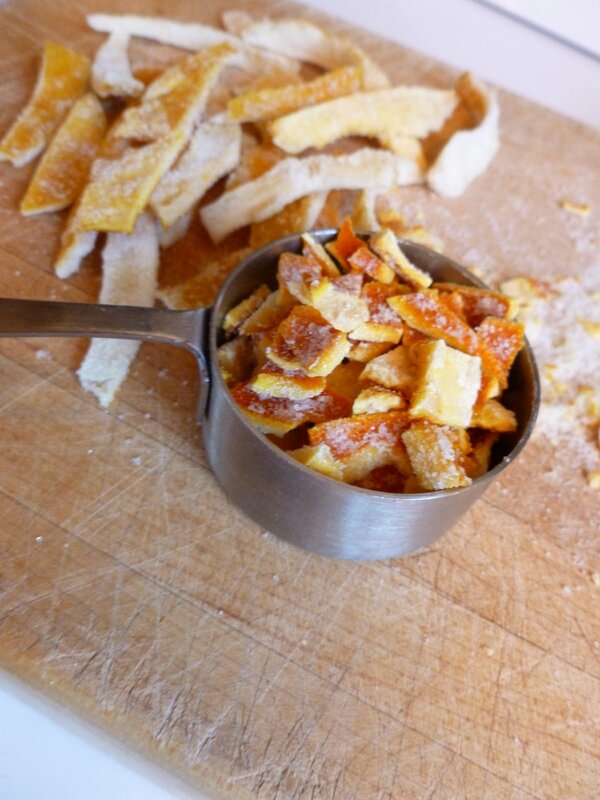 I had been wondering how to make candied citrus peel, this is great! Now I'll be all ready for the holidays.